Come and enjoy the variety of packages that fit your child's needs. There is no better way to learn about Norbeck Montessori than to come and visit our beautiful school in Rockville! We strongly encourage our families to tour our school prior to applying. Our Transitional Two’s (two-year-old preschool) and Primary Preschool programs are growing, and we offer continual enrollment for preschool children ages three to five for 2017–2018. You may contact Norbeck Montessori and we will gladly schedule a date for you to take a tour of our Montessori school and classrooms! Norbeck Montessori follows the philosophy and techniques of the Montessori method developed by Maria Montessori. This time-tested, proven curriculum builds skills and knowledge across a broad range of disciplines. With smaller class sizes than traditional preschool or daycare centers, Norbeck Montessori teachers are able to focus on the individual child, exploring their unique abilities and potential. It is our mission to build upon each child’s curiosity, creativity, and imagination, fostering a lifelong love of learning. Already taken a tour? Apply for admission to our top-quality Rockville Montessori school for the coming year. Practical life skills. We provide our Montessori students with an entire area of the classroom devoted to practicing real, meaningful activities that will help them later in life. These lessons are meticulously put together to help our preschool and kindergarten students develop coordination, independence, and a sense of responsibility, and promote concentration. Sensorial Montessori development. At the early ages of 2 to 6 years old, our preschool and kindergarten students are becoming aware of their five senses. 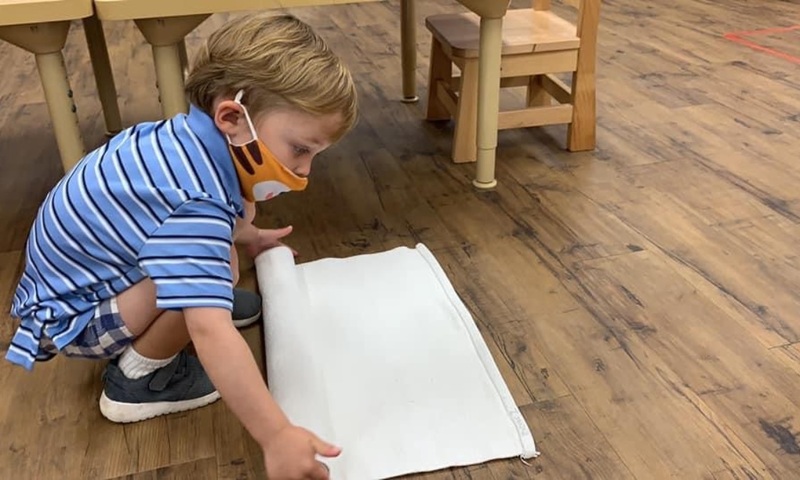 The sensorial Montessori area helps children develop their senses of sight, touch, taste, smell, and sound to become more aware of the physical world around them. This is where our preschool and kindergarten students begin to develop the skills necessary for abstract thought. Language arts. At this time in a preschool and kindergarten child’s life, they are wide open to developing language skills. At Norbeck Montessori in Rockville, we provide the proper environment to help them develop their language skills. Skills such as phonetics, vocabulary, letter, and symbol recognition are learned, then students are transitioned to word cards and eventually reading and writing stories independently. Mathematics. Math is a subject that continuously builds on each skill to achieve greater and greater complexity. After all, you can’t do calculus without first knowing how to add and subtract! Our preschool and kindergarten students learn the basic foundation of mathematics, from counting to understanding quantities and learning symbols. Culture. Although our school is in Rockville, we want to prepare our preschool and kindergarten students to be citizens of the world. Our Montessori curriculum is designed to pique a child’s natural curiosity to “why” and “how” questions to help them make sense of the world around them. Get to learn more about our Montessori School Curriculum by calling 301-924-4233! We have a variety of packages to fit your child’s needs. For detailed information on each package and pricing please click here. Enrollment opens every January for the upcoming summer and fall sessions and we take applicants on a first come first served basis. For links and instructions on how to apply, click here. We strongly encourage all parents and guardians to tour our Montessori school before applying to a preschool or kindergarten program. Call 301-924-4233 to learn more about our Montessori preschool and kindergarten today!